My friend Jenn at Product Reviews has an awesome giveaway. 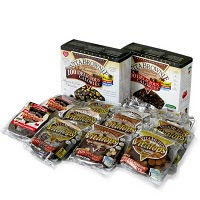 One reader is going to get a Vitalicious Chocolate Super Sampler. Free Chocolate goodies...what could be better? Not only that, but these delicious deserts are full of fiber, low in calories and fat and have protein. Healthy and Yummy. Go here to read Jenn's review and enter to win. Thanks Crystal. Yes, Myspace is being absolutely ridiculous! Facebook had completely removed her page, yet myspace refuses to do anything. The good news though is the photos are still down as of now. So we'll see.